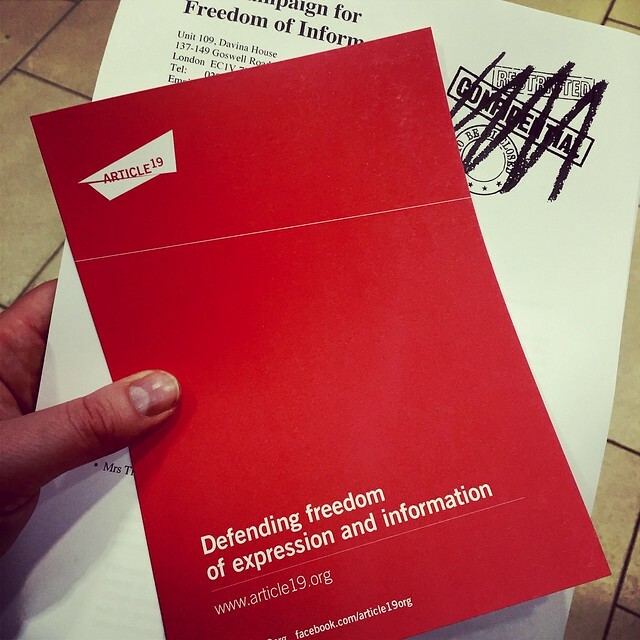 Last night I was very privileged to have been invited to the 30th anniversary celebration of the Campaign for Freedom of Information (CfFoI). I have to concede, that I was more than a little surprised to have received an invite, I am not someone who works within the field and therefore have no first-hand experience of dealing with the Act or any real expertise in the area. That said, as a librarian I am passionate about the importance of an informed citizenry that can both engage fully in the democratic process and hold elected officials to account. For this reason, I am a great believer in the Act and believe that the CfFoI is a vital force for good in a country that has a history of keeping citizens in the dark. Listening to those who have been working for 30 years to firstly establish a Freedom of Information Act, then to keep the pressure on to ensure that an imperfect Act is improved and defended from efforts to try to water it down and diminish it (and we know full well there will be repeated efforts by agents of the state to diminish the Act and undermine its credibility) was particularly inspiring. As someone involved in various campaigns and groups, a lot of the words really rang true. Campaigning is hard. It’s all graft and grind with very little reward. Indeed, the fact that it took 20 years for the CfFoI to be successful in getting an FoI Act on the statute book underlines how difficult it is to be successful. It takes years of dedication, a whole host of sacrifices, very little glory and perpetual optimism. As one speaker said last night, campaigning is not about photo ops and marches, it’s about the daily grind, doing the grotty (and often tedious) work that takes your campaign forward and that, ultimately, leads to success. Successful campaigns are built on years of hard work. From my perspective, I always argue that it is best not to get bogged down in believing that you will get results quickly. That what you aspire to will come to fruition within a short time frame. It won’t. It’ll take years. Some of the change you may aspire to will probably not even happen within your lifetime. The important bit is to do the graft and lay the groundwork. So long as you are realistic, I believe you can maintain that dedication and enthusiasm for whatever cause you are involved in. If you are too unrealistic, you will very quickly find yourself burnt out and disillusioned. Fight for what you believe in, but be aware that it will take time, effort and dedication. Change does not come easy. The people behind CfFoI have kept that dedication, that determination to be successful in effecting real change in terms of how we are governed. By creating an environment where at least there is a chink of light where before there was only darkness. The challenge now, in my view, is to turn that chink of light into something bigger. 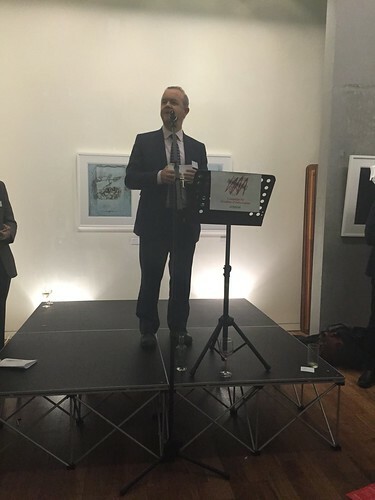 Ian Hislop speaking at last night’s event. One other thing that was re-emphasised for me last night was the importance of building connections across the information profession. I certainly find within the world of the librarian we often seem to exist in a silo that is detached from other information professionals. I struggle sometimes to understand this. Of course we all have our individual areas of expertise, but I think it is important for librarians (who after all are concerned with facilitating access to information) to be aware of and engaged with such discussions across the profession. As librarians we should be engaged with the fight for freedom of information, we should be helping citizens to utilise the tools available to them to hold their elected officials to account. We should be engaged in data protection, particularly in a world where data is increasingly being bought and sold, often without the awareness of those who the data is extracted from. As librarians we should be engaged in making information and data more accessible with regards to the state, whilst protecting individuals from the commodification of their personal data. When one considers the ethics that underpin our profession, it is clear that we should be engaged in these areas. The last ten years are not an end with regard to the battle to ensure transparent governance, they are a beginning. With further funding cuts in the pipeline, the growth of private sector contracts to deliver public services presents new challenges. As government seeks to outsource public services, so we lose our right to know. It is clear that the Freedom of Information Act will need to be expanded and adapted in the years to come. To have any hope of achieving that, groups such as the CfFoI need to continue keeping the pressure on. But for them to do so requires all of us who believe in their aims to show our support in whatever way we can to ensure that not only does the Act continue to remain relevant but that the light it shines on how we are governed gets brighter rather than dimmer. The efforts of those who have led the campaign over the past 30 years demonstrates that whilst it won’t be easy, we can be optimistic. You can find out more about the Campaign for Freedom of Information here. I’d urge you to support them in whatever way you can.